The family-friendly franchise is known for its wide variety of nationally award-winning chicken wing flavors available in a range of heat indexes and made-to-order with fresh ingredients. ECW+G also features a carefully crafted menu that includes burgers, skillets, flatbreads and kids meals. East Coast Wings + Grill was named one of The Top 200 Food and Restaurant Franchises of 2018 in the annual list by Entrepreneur Magazine. The prestigious list, organized by individual food categories, placed ECW+G at No. 20 in the Full-Service Restaurant sector. The EBITDA driven franchise has all the ingredients to ‘cook up success’. The formula built by ECW+G is made to weather any external economic factors or shift in consumer trends and keep costs down while keeping quality up to increase guest counts. The brand is currently remodeling existing locations and all new restaurants will be the 2.0 version. The refresh is designed to elevate all platforms of the brand for an enhanced dining experience featuring a new logo and revamped interior including new floors, walls, fixtures and furniture, as well as a designated take-out service area and full spirits bar. There are 58 wing flavors that can be made at eight different heat indexes so that guests can choose any wing flavor and select their desired level of heat. Inspired by different cultures—The Islands, Tex Mex, Classic American, Asian, Southern BBQ, European, Bayou and more—at East Coast Wings + Grill, guests can choose from hundreds of possible combinations of flavor + heat for their perfect wing sauce. Sauces can be added to select entrees such as ECW+G Buffalo Salad™ and Buffalo Chicken Lettuce Wraps. While wings remain a staple, the restaurant features options that will appeal to the entire table. 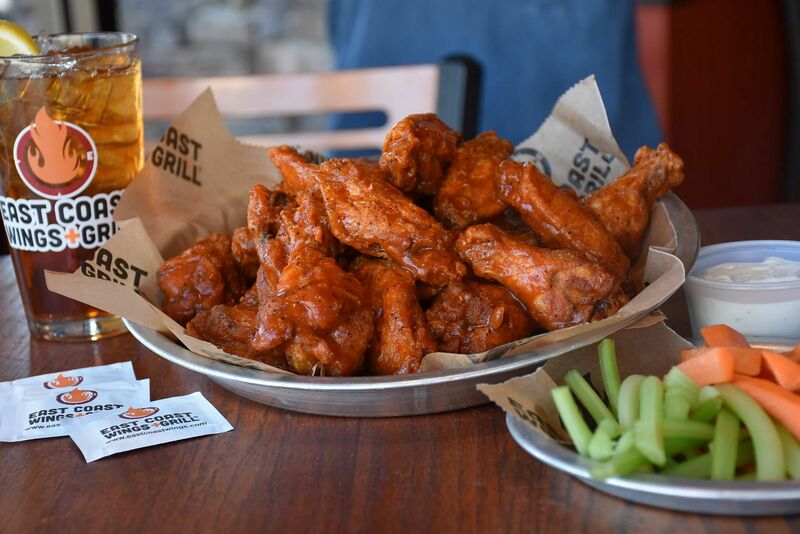 North Carolina based East Coast Wings + Grill is a fast-growing, casual, family-dining franchise that puts the spotlight on buffalo wings. The carefully selected menu has a variety of options to satisfy every family member’s taste buds. 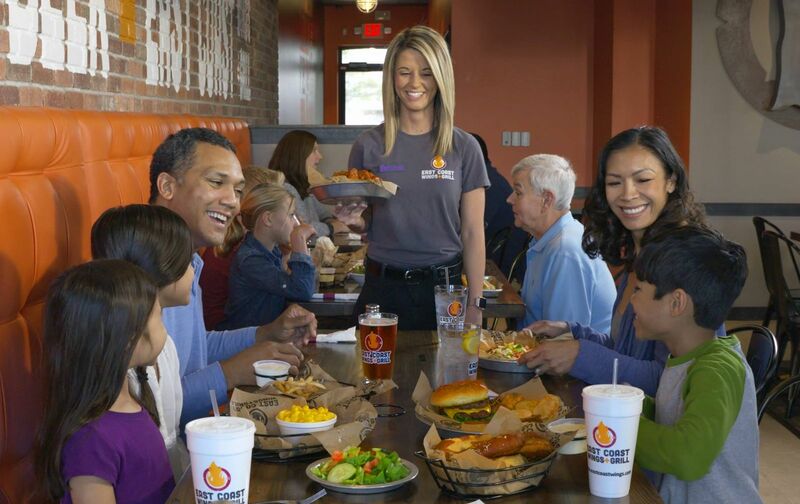 With more than 60 locations nationwide currently operating or in various stages of development, the burgeoning franchise recently secured itself a top spot on Restaurant Business Magazine‘s “Future 50” list of fastest-growing U.S. mid-size restaurant chains for the second consecutive year. Entrepreneur magazine also named East Coast Wings + Grill one of the nation’s top franchise investments and Franchise Times magazine ranked the company No. 395 on its “Top 200+” list of top revenue-producing U.S. franchises. The concept has also been recognized by The Franchise Grade and Franchise Business Review for transparency during the franchise sales process, franchisee support and overall franchisee satisfaction. For more information about East Coast Wings + Grill or its franchise opportunities, visit www.eastcoastwings.com or www.eastcoastwingsfranchise.com.